I am sure I have mentioned here before that we live in an apartment but we have a good sized balcony. 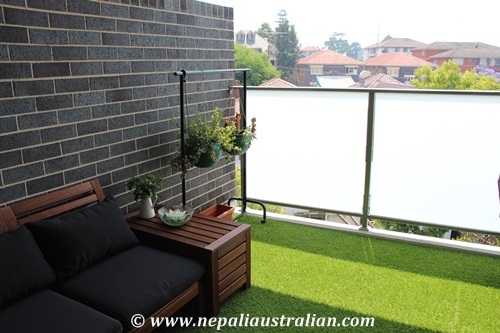 We have converted the balcony into a garden with artificial grass and pot plants. 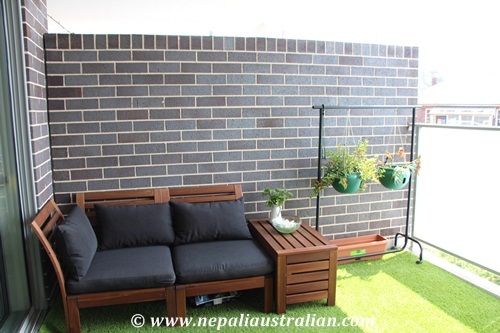 We also have a nice comfy outdoor sofa as in the photo . We love the balcony as we can relax and enjoy the winter afternoons and also use it for entertainment and BBQ. Anyway it is the start of summer now in Sydney and we have been seeing lots of birds coming to our balcony which include the Indian myna and pigeons and an occasional parrot too. But recently we noticed that there are pigeons on the balcony almost all the time. I quite like it because we are teaching Chhori words and I can show her real birds now and not just pictures. A couple of weeks ago, while I was sitting on the sofa, suddenly a pigeon came flying out from under the sofa and scared the crap out of me. It was so sudden and I was not expecting that. My mum and AS also observed that there was more frequency of the pigeons on the balcony. One day while we were sitting on the outdoor sofa a pigeon tried to come to the balcony but flew away as we were there but it would check in every 5 or 10 minutes so we were kind of surprised. Seeing this behaviour I causally mentioned that may be the pigeons had laid eggs here so they are coming back so often. Out of curiosity, AS checked under the sofa and lo and behold, there were two tiny pigeon’s eggs right at the back. It was a very surprising discovery for us and we didn’t know what to do next. As normal, we Googled to find out some more information on what to do next. The best answer we found was to leave them there until the baby pigeons arrive and clean the area once they fly away. I think the eggs have been there for more than 10 days or so and we think the eggs should hatch in the next week or so. I think the mother and father take turns to sit on the eggs and mostly there is one bird under the sofa all the time. After the discovery we try not to go out in the balcony that often as we don’t want to scare the pigeons. But we are very curious to see the baby birds soon. I hope they have healthy babies. I will keep posting the updates about our new guests soon. If you have any tips for me , please do share. 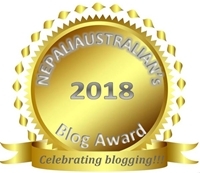 This entry was posted in Australia, Personal and tagged australian, australian nepali, bird, M from nepaliaustralian, Nepal, Nepalese, Nepali, nepali australian, Nepali blog, Nepaliaustralian, pigeons. Bookmark the permalink. Your balcony is lovely. Very inviting.I love your idea of hanging baskets on the clothes hanger. Fantastic. The pigeon babies will be fun to watch when the babies hatch. A word of warning- We once had a potplant that pigeons nested in and when we touched the edge of the pot to peer at the babies, bird lice crawled up my arms and all over me. They are very small and Very itchy. Be careful with your little one with this. Thank you so much, we love our balcony. The eggs have hatched now. Thank you for the warning. Once the babies leave, I am going to disinfect the whole area to make sure we don’t have problem in future. Nice , cozy balcony you have there. What a neat new friend! And wow, Chhori is growing so fast! I bet she enjoyed seeing the pigeon. 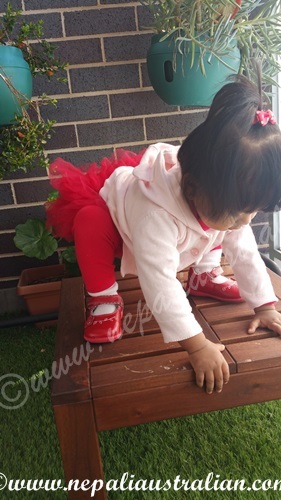 Now we have 2 baby pigeons and Chhori loves to watch them They are cute and makes this cute noise. Merry Christmas !! i have alot of birds as well. i dont mind them. when i lived in my old apartment, they would come right up to the window and peck at it. it was really nerve wrecking! hmm perhaps i will try artifical grass. You can convert your balcony to something you like. I am sure bit of work and some great idea can make the space useable and enjoyable. If you put a bird feeder, you will get all kind of birds. The only thing is they might poo everywhere as well 🙂 . Oh yes I hadn’t thought of the birds pooing everywhere 😔 but maybe some little garden décor would be nice.